Mr. Nhero Veraflor gives critique on the pictures according to their photo composition. The pictures are taken by the Public Information Officers from different District Engineering Offices of Region VIII during their hands on activity on the topic “Beyond Basic Photography” on June 9, 2016 on the different sites of infrastructure projects of the DPWH -Samar 1st DEO at Calbayog City. This was emphasized by Department Public Works and Highways (DPWH) – Samar 1st District Engineering Office Assistant District Engineer, Loreto M. Cedro as he delivers his welcome remarks to the Public Information Officers (PIO) of DPWH-Region VIII during its seminar workshop under Communication Development Program on June 9-10, 2016 held at Marju Krissel Hotel & Restaurant, Brgy. San Policarpo, Calbayog City. 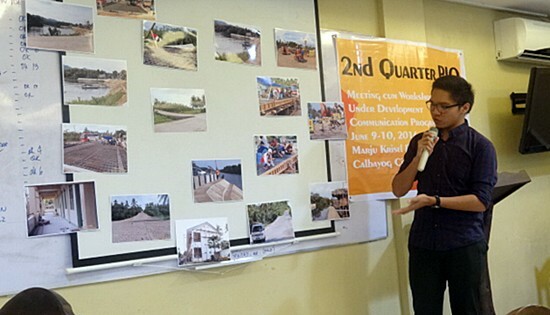 The seminar was hosted by DPWH- Samar 1st District Engineering Office thru its PIO Designate, Ma. Nenita Gomez and thru the initiative of Regional P.I.O, Ms. Antonietta R. Lim. Several PIOs from different District Engineering Offices (DEOs) in the region participated the event with the aim to acquire and develop skills under the Communication Development Program. Topics focused during the seminar were the Newsletter Production and Beyond Basic Photography by Mr. Nhero Veraflor as a Resource Speaker. On the first day of the seminar, lecture-discussion on Basic Photography was taught to the participants concentrating on the different photo composition. It was a very productive day for the PIOs wherein after the lecture-discussion, they were able to visit different sites of infrastructure projects of the DPWH -Samar 1st DEO as their subject for the photoshoot. From the on-going construction of 2-storey school building for Senior High School to the completed Diversion Road Project and Flood Control Projects, PIOs were able to explore different ways to take pictures on infrastructure projects of DWPH. “I’m glad that there is this kind of seminar conducted to DPWH-PIOs because this is really helpful in making our reports.” said one of the participants. The critiquing of pictures was conducted on the second and last day of the seminar-workshop. This activity gave much more learning to the participants as they were able to pin point their needs of improvement in taking pictures. The rest of the seminar was allotted on a lecture discussion about newsletter production again by Mr. Veraflor as the resource speaker. Lots of questions from different DEOs were raised to Mr. Veraflor as many of these District Engineering Offices receives negative assessments from the Regional Office on their newsletters. Some of these were on the lay-outs, the captions, pictures, etc. but it was all clarified by the resource speaker. Having not enough time, DPWH PIO’s agreed to continue the topic with hands-on activity in making newsletter on their next Seminar Workshop which will be tentatively held in the month of September, 2016. The continuous conduct of seminar workshop with DPWH-PIOs will improve the capacity of the designated District PIOs on their duties and responsibilities and enhance their commitment to the department’s goal to continuously inform the public of its programs, policies and projects within their respective area of jurisdictions. 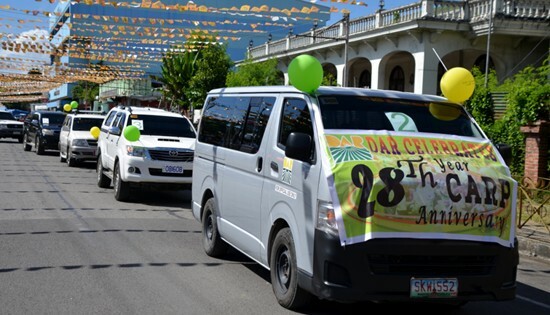 TACLOBAN CITY – The Department of Agrarian Reform (DAR) in Eastern Visayas kicked off this morning (June 15) its commemoration of the 28th year of implementation of the Comprehensive Agrarian Reform Program (CARP) in the country with a motorcade around the city. According to DAR-8 Regional Director Sheila Enciso, the celebration will just be a simple one, highlighting the transformation of agrarian reform beneficiaries from mere farmers to entrepreneurs. On June 21, a mini-trade fair at the DAR Regional Office compound will be opened to the public showcasing various products ranging from organic crops to processed foods, handicrafts and organic fertilizers produced by the different agrarian reform beneficiary organizations (ARBOs) throughout the region. These are now the results of the various trainings and assistances extended to them under the Program Beneficiaries Development component of CARP, Enciso said. Among the assistances extended to them was thru the Agrarian Reform Communities Connectivity and Economic Support Services (ARCCESS) which was a package of support services that include common service facilities and trainings to transform them into agri-entrepreneurs, she added. Another assistance extended to them was the Complementary Assistance for the Rehabilitation and Empowerment (CARE) of small holder farmers wherein they were taught how to convert trash into cash by producing organic fertilizers using African night crawlers, Enciso further added. Republic Act 6657 or the Comprehensive Agrarian Reform Law (CARL) was signed on June 10, 1988 by then President Corazon Aquino and took effect five days later. It was amended twice by Republic Acts 8532 and 9700. CARL expanded the scope of the Marcos agrarian reform program to cover all agricultural lands regardless of the tenurial status. At the moment, DAR has covered and distributed 430,115 hectares of agricultural lands in Region-8 to about 238,950 agrarian reform beneficiaries under CARP’s Land Tenure Improvement component. PARIS, France – Producer of the world’s most innovative runways impressed again yesterday with her famous floating catwalk on the Seine River. J Summer Fashion Show 2016, which premiered seven unique haute couture, pret-a-couture, and diamond collections against the moving backdrop of Paris, has strengthened Jessica Minh Anh’s position as a global influencer. According to Paris Match’s editor Catherine Schwaab, Jessica is electrifying the fashion world with her extraordinary vision and irresistible charm. Alongside Sydney’s Ocean Catwalk earlier this year, J Summer Fashion Show has confirmed Jessica Minh Anh’s theme of 2016 to be “catwalk on water”. Guests were strategically seated facing the multi-faceted glass windows of Le Jean Bruel to watch models walking in front of them as if they were walking on water. A perfect portrait of modern beauty with limitless energy, Jessica Minh Anh opened the highly anticipated showcase in a striking multi-colored exotic creation by German sensation Miranda Konstantinidou. Following the stunning catwalk producer is a youthful line up of models in intricate silk dresses teamed with architecturally cut statement jewelry. Miranda’s collection, which added a lot of excitement to classic chic, defined the concept of “extroverted but relaxed” luxury. Returning to Jessica Minh Anh’s iconic catwalk, Pakistani talent Syeda Amera presented a glamourous pret-a-couture collection inspired by Eiffel Tower’s magnificent structure and its decorative grillwork arches. Each design showcased intricate embroidery, three dimensional sequins embellishments, and daring cuts. Using handcrafted details on luxurious fabrics, Syeda’s collection added edge and elegance to the spectacular event. Next, Polish designer Teresa Rosati transformed the classic look into the new age’s romanticism using natural silk, lace, and transparent fabrics. Her black and white collection called “Faces of love” introduced modern femininity with deep necklines and polished silhouettes. Icelandic jewelry designer Jóhannes Ottósson showcased a captivating diamond studded gold collection inspired by the majestic nature of his homeland. The clean and sleek designs of NOX defined true contemporary classic. A master of balancing beauty and rarity with distinctive style and impeccable craftsmanship, Johannes successfully portrayed effortless elegance and allowed the diamond’s radiance to shine supreme. Accompanying the exquisite jewelry pieces is a floral silk collection by Ukrainian brand LaFress, who inserted beautiful lightness to the grand catwalk. The creative designs, which were inspired by the epic scenery of soft snow on mountaintops, portrayed a mix of emotions and imaginations through the use of natural colour pallet with some darker detailing. The emergence and blossoms of individuality was the center of the collection. Conceptualizing roses as an enduring beauty in the harshest of environments, Saudi Arabian fashion house Ot Kutyr Turk Jadallah presented a timeless collection using red and beige alongside their signature black and white colour scheme. Soft fabrics were artistically mixed with crystal embroidery to convey both fragility and power. Turk Jadallah’s charming creations added sophistication and refinement to Jessica Minh Anh’s exclusive runway. The mesmerizing finale collection by Lebanese haute couturier Antoine Kareh was inspired by the beauty of the butterfly and the freeing nature of the dandelion. The designer revealed a progressive mix of multiple layers and architectural cuts, which accentuated a woman’s body and created endless femininity. Saving the best for last, Jessica Minh Anh appeared as a vision in a breath-taking white gown embroidered with thousands of multi-coloured butterflies, paired with a matching long cape. The magnificent creation, which highlighted Jessica’s perfect curve, left audience in awe of class, sensuality, and ultimate glamour. J Summer Fashion Show 2016 marked Jessica Minh Anh’s 14th highly successful showcase since her history-making catwalk on London’s Tower Bridge. The queen of catwalk stunts, who has continuously captured the world’s attention with her theatrical productions, has already started planning the next phenomenon in the United States. “I believe the most outstanding creations should be showcased at the best of locations with exceptional catwalk concepts. I’m determined to make it a reality every time” said Jessica Minh Anh. QUEZON CITY — A recently established youth organization expressed “deep concern” on the ongoing police operations in several cities in Metro Manila. They claim that Oplan Rody which enforces anti-vice, decency and curfew decrees “shows utter disregard to realities” of an evolving and booming metropolis and will “harken back to the darker days of our history”. The Samahan ng Progresibong Kabataan or SPARK argued that Oplan Rody as well as the various city council resolutions has failed to account major societal changes in the country today making hundreds of thousands of enrolled, working and even out-of-school youth automatic prey to the absolutist and unrealistic decrees. The young activists are calling for the immediate end of Oplan Rody until city councils modify their resolutions and take into consideration the realities of present-day conditions, lay down the mechanisms that will safeguard the youth from human rights abuses possibly by law enforcement units and more importantly address the societal roots of petty crime. “With the dismal preparation and implementation of the K-12 program and only a handful of schools “K-12 ready” because of the shortage of classrooms exacerbated by the insufficient budget, the K-12 ready schools are congested and will require the employment of shifts reaching up to 9pm to accommodate all enrollees,” said Joanne Lim, leader of SPARK in the University of the Philippines, Diliman campus. She further explained that, “Chances of these students going beyond the curfew will also be amplified with the upcoming monsoon rains and expected heavy flooding, add the lamentable state of the public transportation system and road networks which will all contribute to the longer travel time from school”. The activists also raised the issue of working students, who are more likely to be scheduled to work on graveyard shifts so as not to collide with the class schedules. “Even the Labor department’s Special Program of Employment for Students (SPES), mandated under Republic Act No. 9547 allows students as young as fifteen to be employed so that the deserving may continue studying. This again is contrary to the unrealistic curfew hours employed by various city councils,” Lim pointed out. The group is wary that even the “seemingly harmless” sudden checks of identification cards of youngsters are “hauntingly similar to the Martial Law days wherein police have the prerogative to demand details from people”. Lim insisted that these police operations should be supervised and implemented by professionals such as social workers and officers from the PNP Women and Children Protection Center since it concerns minors. She fears that, “if the implementation of these ordinances are not properly regulated, too much power may be given to the police force and this can be taken advantage of if put in the wrong hands”. “Operations against petty crimes, aside from having the poor most susceptible, also fail to address the roots of these social ills and will only lead to a growing cycle of poverty and crime. Rather than solving the problem of criminality from its source by taking steps to alleviate poverty, the steps taken are those which hold the poor most vulnerable and leave the most responsible and those in power free from repercussion,” Lim expounded. SPARK likewise called on all freedom loving citizens specially the media and human rights institutions to be extra vigilant “especially as it appears that a police-state is what awaits the country under the administration of President-elect Rodrigo Duterte, who has risen to power on a platform of anti-criminality”. MANILA – On the eve of the start of the comprehensive government energy policy review, and proving that the incoming rainy season is not an impediment to fully embrace solar energy, Greenpeace launched the Solar Rooftop Challenge, an aggressive information campaign that highlights the potentials of producing solar energy in the Philippines. The Solar Rooftop Challenge highlights the benefits of using solar and busts misguided notions that hinder individuals and companies from taking it up by showcasing existing solar rooftop installations of urban middle class households, celebrities, churches, schools, government buildings and private establishments, and through sharing empowering stories of people who have joined the solar rooftop revolution in the country. "Today, we are launching the Solar Rooftop Challenge to create a platform for the young and urban Filipinos to join the discussion on renewable energy, particularly the use of solar energy. At the same time that the young, hip and trendy Filipinos are ‘arriving’, so is the use of solar energy,” explained Reuben Muni, Climate and Energy Campaigner for Greenpeace Southeast Asia Philippines. The launch event featured informative lectures and discussions by Obet Verzola, author of the book Crossing Over: the Energy Transition to Renewable Energy and Executive Director of Center for Renewable Electricity Strategies (CREST), and Dann Diez, Executive Director of Sustainable Energy and Enterprise Development for Communities, who presented data and experiences showing that solar energy installation is affordable, accessible and more cost-effective in the long run. The launch also unveiled the video series Juana Solar Busts a Myth in Minutes, which features celebrity advocates Saab Magalona, Yam Concepcion and Dingdong Dantes busting the myths surrounding the use of solar energy. The videos debunk the myths that solar energy is expensive, unreliable, impractical, uneconomic, and beyond the reach of the average Filipino. The Solar Rooftop Challenge also happens at the same time that the Philippine government is starting its comprehensive review of the country's energy policy in order to reduce dependence on coal and come up with a national framework for a just transition to renewable energy and a low-carbon economic pathway. “By showing that many Filipinos across the country have already made the switch to solar energy, we are sending a message to the incoming Duterte Administration to take to heart this energy policy review and listen to the clamor of many more Filipinos who want clean and renewable sources of electricity for their homes, offices, and businesses,” added Muni. By telling empowering stories, the Solar Rooftop Challenge showed that the solar revolution is already happening in many parts of the country - from a solar-powered church, to solar-powered schools, malls, and many households. It aims to serve as a platform for the thousands of Filipinos who have already embraced the solar revolution to show and tell their stories as well as exchange and share ideas and information to persuade other people who are keen on taking up the challenge of producing their own clean and renewable electricity from their rooftops. “The stories will show energy independence through solar energy. We will break the myths surrounding renewable energy and create a powerful testament on its practicality, cost-effectiveness, and reliability to propel the Philippines to a future powered by clean and sustainable energy,” Muni said. TACLOBAN CITY – The National Maritime Polytechnic (NMP), a premier Maritime Training and Research institution and an attached agency of the Department of Labor and Employment (DOLE) located at Brgy. 97 Cabalawan was one of the recipients of donations of books from The Asia Foundation which is one of the number of agencies that grant book assistance to support institutions in both private and government entities. Last May 12, 2016 two (2) boxes containing eighty eight (88) books in different titles arrived NMP as a part of the yearly allotted donation granted by the Asia Foundation. The donation was made possible through the Asia Foundation Coordinator, Mr. Reynaldo Ocampo and Ms. Maria Chona B. Rama, Head of the Learning Resource Section (LRS) of the NMP. Almost three (3) years have gone when the super typhoon Haiyan or locally known as Yolanda struck Tacloban City in where seventeen (17) buildings inside the NMP premises have been destroyed or damaged along with the training equipment submerged in sea water, and the agency's library containing valuable maritime books, videotapes and a number of technical reference materials were destroyed or heavily damaged resulted the stoppage of the course offerings of the agency during that year until 1st semester of the succeeding year. Since then it has been a part of the agency's action plan through its Learning Resource Section (LRS) to seek books and other reference materials for donations from other maritime institutions and agencies in addition to acquisitions funded from its budget. 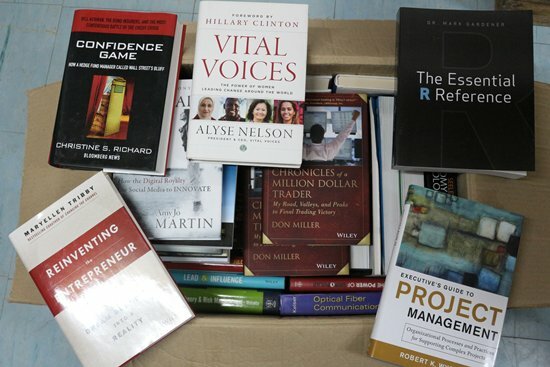 The donated books is a big help to the NMP in its continuous efforts to rebuild its library and to support the clientele - the Filipino Seafarers.